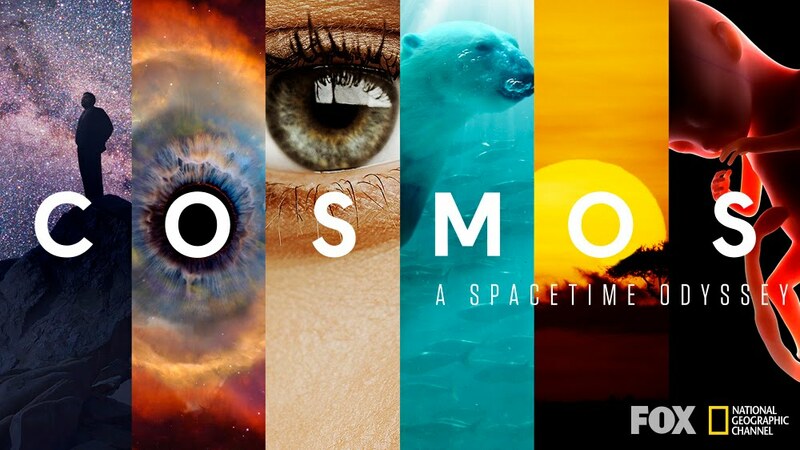 If you’re not watching Cosmos: A Spacetime Odyssey every Sunday on Fox, you are seriously missing out. Neil DeGrasse Tyson is everybody’s favourite scientist, and the show is both gorgeously shot and does a fantastic job explaining big scientific concepts. It’s a lot of fun to watch. 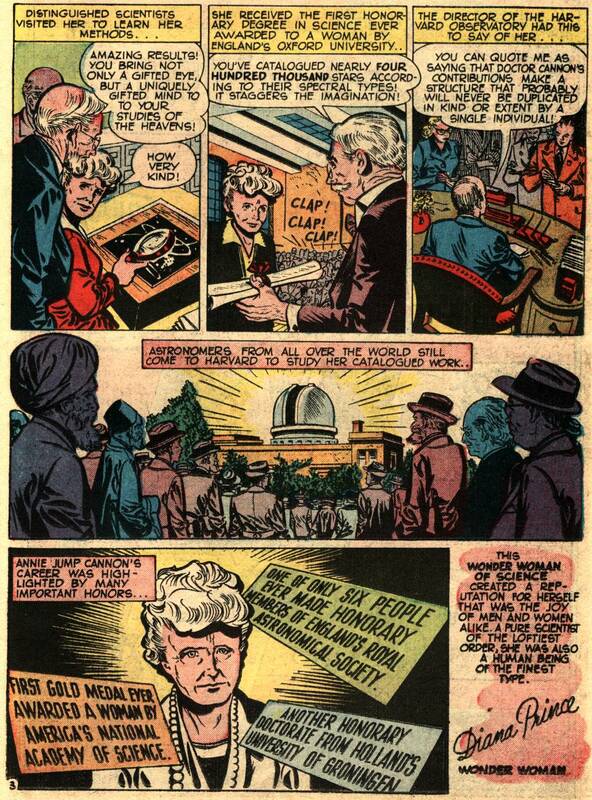 Last weekend, Cosmos profiled Annie Jump Cannon, famous for counting and classifying thousands of stars. 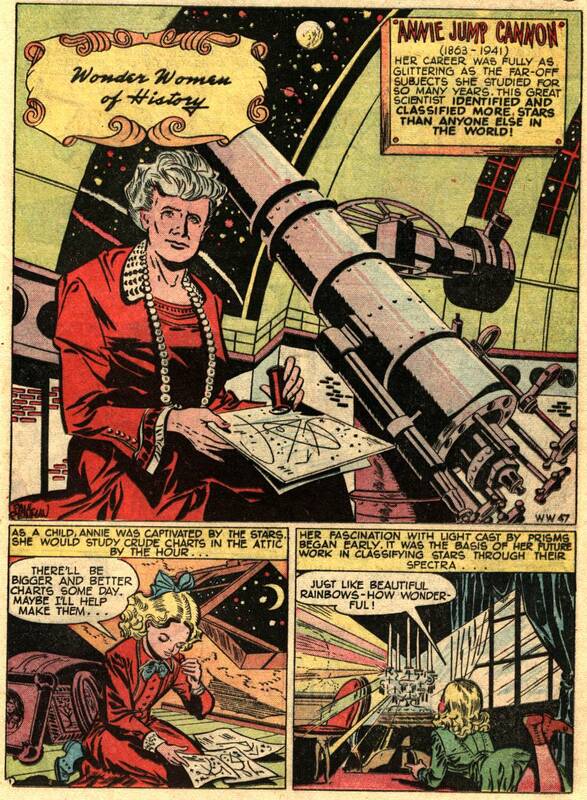 It was great to see Cosmos spotlight female scientists, and it reminded me that Annie Jump Cannon was profiled decades ago in Wonder Woman as part of the regular “Wonder Women of History” feature. Imagine how cool it must have been to get a comic with several Wonder Woman stories and a strip like this in each issue, and all for a dime. 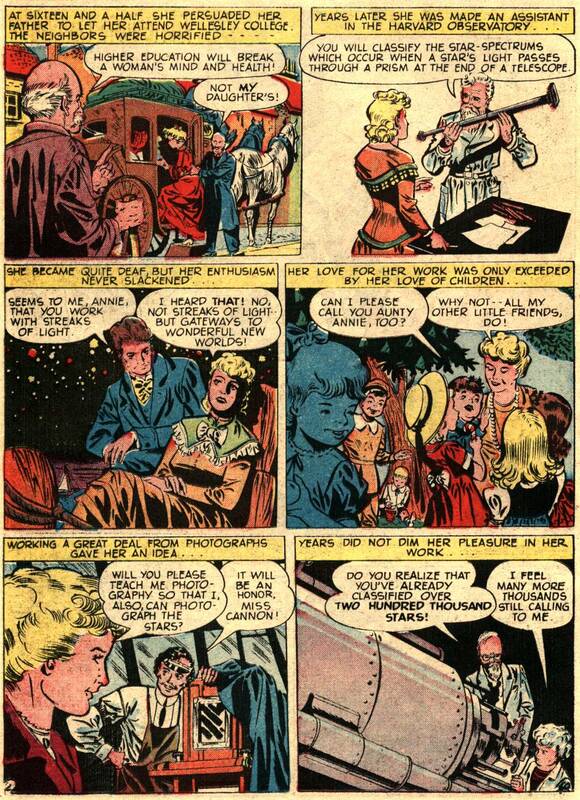 Imagine as well, with so many male superheroes dominating the newsstands and men dominating every level of society generally, how inspirational it must have been for young girls in the 1940s to not just have Wonder Woman as a hero, but also scores of real life women to look up to. “Wonder Women of History” was a fantastic feature; it profiled a wide array of women, and was drawn by some of the Golden Age’s best artists. I’d love to see DC collect the strips in one volume. They’re a great piece of comic book history that’s gone forgotten for far too long, and I think that people would really enjoy them and learn a lot. This entry was posted on April 29, 2014 at 2:06 pm and is filed under Comics, TV, WW Comics. You can follow any responses to this entry through the RSS 2.0 feed. You can leave a response, or trackback from your own site. I linked to this blog post from my women in science tumblr http://doublexscience.tumblr.com/post/84334322621/annie-jump-cannon. Thanks for providing the full comic! Awesome! Thanks so much for sharing the post. That’s so cool! I’d love to see pictures if you post the comic! Will do. I just showed it to Andrea Dupree, past president of the American Astronomical Society and probably the closest thing to Annie’s current successor at Harvard, as she is an expert on stellar spectra – she loved it. That’s absolutely fantastic. I’m so glad that people are enjoying the comic after all these years. I did a photo shoot at the Great Refractor today – http://planet4589.org/jcm/pics/14/hco/index.html – the comic is visible in http://planet4589.org/jcm/pics/14/hco/DSC_0048.JPG if you look carefully, in a temporary display location – we hope to spruce the place up later this year and it will get a proper display I hope. You may also enjoy the image of Annie Cannon’s 1899 ‘pocket calculator’. (We don’t really know if it was Annie’s, but I like to think it is). This is super awesome! Thanks so much, Jonathan. I’ll put up a new post tomorrow with some pictures so everyone can check them out! Not directly about the post, but two other great comics collections highlighting scientist women are Dignifying Science and Primates, both by Jim Ottaviani. Reblogged this on Patricia Daukantas, Science Writer/Editor. Reblogged this on The CGS Unit. I would love to see those Wonder Women of History collected into a book! I loved them when I was a kid. They told me that you didn;t have to be an amazon or have super powers to do something great! They would make a fantastic book. The art is lovely, the stories are great, the message is all sorts of empowering, and it’s such a great piece of comic book history. Do you have any pull at DC, Trina? Are you kidding, Tim? They probably hate me at DC! I make no secret of the fact that I detest what Brian Azzarello has been doing to Wonder Woman. So, no pull. Oh, dang. There goes utilizing your star power! I’ve been pretty hard on the current run, too. I don’t know if “Hey, we’re not super into what you’re doing now, so can you reprint some of the old stuff we like?” is going to really sway the powers that be at DC.